You’ve landed here because you want to live in Sarchi or you are looking for Sarchi real estate for sale. And you found the best company to represent you. 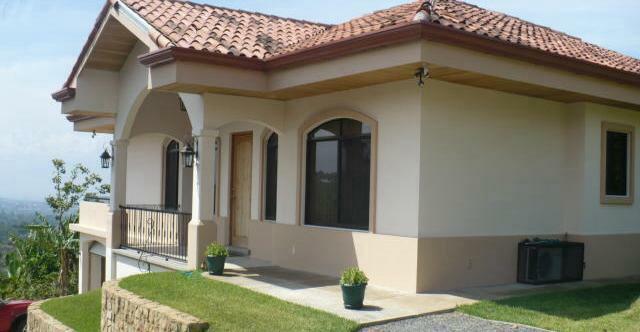 Sarchi offers rural living, away from the city and traffic. Nonetheless, it is only a few minutes drive to get to Grecia, where you will find all the amenities that you will need. The town of Sarchi is very Tico, that’s why many expats love it there. They enjoy breathing the clean air when they retire. And that’s what you’ll get when you live in Sarchi. 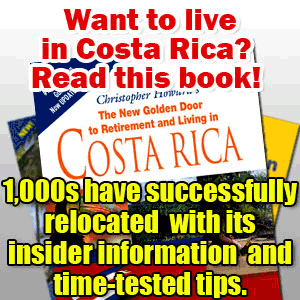 Are you planning to move to Costa Rica soon and maybe retire to Sarchi? 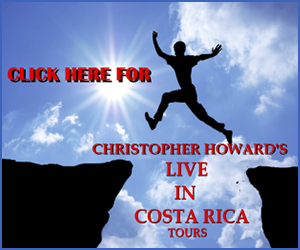 This small town is the true heart of the artist community of Costa Rica. 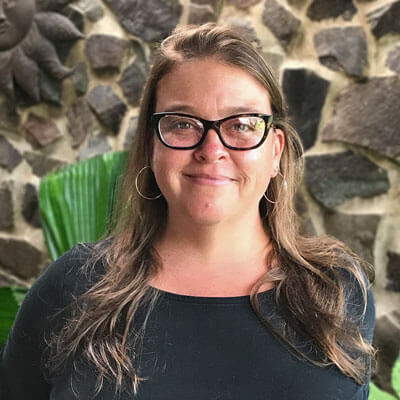 My name is Brooke Bishop and I am your real estate agent in Sarchi and I’d like to tell you a bit more about this beautiful little town that is located in the mountains of the city of Alajuela. To live in Sarchi is like living in a small town with all the amenities you need nearby. You’re only minutes away from shopping in Grecia and Naranjo. Although Sarchi does offer its own shopping, each of these towns has its own flavor. Sarchí is located about 15 minutes off the Pan American highway and 35 from the International Airport, Juan Santamaría. The closest city is Alajuela, just for your orientation, have a good look at where it is located on the map we’re showing here. Of only 22 m2, you can hardly call Sarchi a city. It is located at an altitude of 3,200 feet. Sarchi is the gateway to Los Bajos del Toro. This is a great recreation area which opens up to the Great Northern Plains and San Carlos. So, if you enjoy being surrounded by nature, enjoy bird watching, hiking, and photography, to live in Sarchi is like being in paradise. The town is easily accessible from the highway either by the Grecia exit or the Naranjo exit. The authorities are planning that Sarchí will have its own exit from the Pan American highway, but I don’t believe it until I see it. This will make it more convenient to visit San Jose, the beaches, and the airport. It is also in the center of the country, which makes both coasts conveniently only a few hours away. 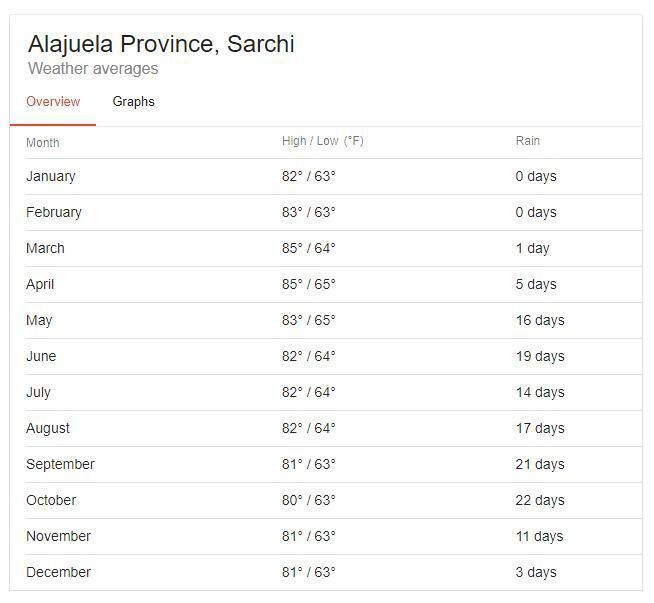 Is Climate a good reason to live in Sarchi? The climate in Sarchi is very moderate and perfect for those who want to stay away from the heat. It’s cool enough to use cross ventilation instead of air conditioning. Some like to use ceiling fans during the warmer days, mainly during Easter week. The average temperature is in the 80’s throughout the year and rainfall varies as seen in the image below. Usually, you will find the cooler temps at the higher altitudes, but rainfall may also change. The winds also interfere a lot. 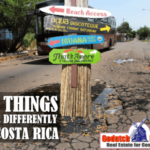 So it is important you learn as much about the micro-climates that Costa Rica has to offer. 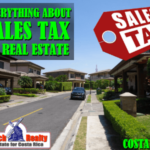 Therefore, it is important you do your homework before you purchase property in Sarchi. Check today’s weather and forecast in Sarchi now. You should also learn more about the locations with the best weather conditions of the Central Valley. Residents of Sarchi are mostly local, with a retired expat here and there. In nearby Grecia and Naranjo, you will also find other expats, as well as in Atenas. The Sarchiceños as the locals are called are used to foreigners, so you can feel safe and completely comfortable when you live in Sarchi. For the ladies who like to socialize, check Blooms ladies club. Blooms is a group of about 200 Blooms includes Canadians, Australians, French, Dutch, Americans, British, Germans, and South Africans as well as several English-speaking Ticas. On the last Tuesday of every month, the female English-speaking community of the Valle Central gets together in the morning for “Kaffeeklatsch”. Catholic Church: This is one of Costa Rica’s most beautiful churches that features a vaulted hardwood ceiling and carvings contributed by local artisans. (Sarchí Norte). The Artisan Market: A large warehouse-like store selling crafts of all kinds, operated by the local Coop. Taller Eloy Alfaro: An oxcart producing workshop, using machinery powered by a waterwheel. World’s Largest Oxcart: A huge, brightly painted oxcart in central park. This oxcart was built in 2006 in order to get the name of the town into The Guinness Book of World Records. Else Kientzler Botanical Garden: A 17-acre Botanical Garden home to over 2,000 different plants from around the world. Joaquin Chaverri: a large store that offers souvenirs and oxcart, where you can see the artisans at work painting the oxcarts. 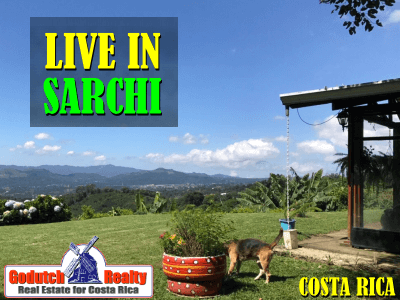 Those who live in Sarchi enjoy an incredible experience as Sarchí is truly the heart of the artist community of Costa Rica. Sarchí Valverde Vega is home to the artisan woodworkers of the country. Nearly all the souvenirs in Costa Rica originate here. 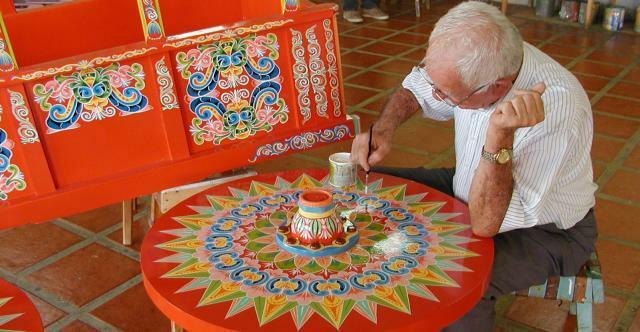 You can still see the artisans painting ox cartwheels, or go to Eloy Alfaro’s workshop and souvenir store, and see how it was done before electricity; with water wheels! As well as artisans, “Sarchiceños” also are farmers as is indicative of this fertile area. Sarchi is not only famous for its oxcart production. You will find many furniture factories that produce incredible hardwood furniture. With all of the artists in town, it is no surprise that Sarchí is one of the only tourist towns in this area, and has lots of tourist traffic in the dry season months. This offers another opportunity for the residents of Sarchí to make a living, and as a result, there are several small hotels and lots of great restaurants! If you’d like to go to the movies, you need to go to Plaza Grecia or to Alajuela. To go swimming, try Centro De Eventos Nuevo Renacer. If you like butterflies, Mariposas Sarchi should be a lot of fun. For simple grocery shopping, you can stay in town. There are several smaller grocery stores (called pulpería = mom & pop store) and midsized supermarkets. For imported and specialty products, you’ll have to drive to either Grecia or Alajuela. The closest shopping mall is Plaza Grecia El Ingenio and serious shopping is available in City Mall Alajuela. The Farmer’s market is held every Friday, 400 meters west of the Banco Nacional. You can download the latest price list of the products offered at the “Feria del Agricultor” or Farmer’s market here. There is also a Campo Ferial, check it out. If you’re religious, you have a choice of several churches in Sarchi. For public health services, you can stay in town. But if you’re looking for a public hospital for a medical emergency, you need to go to Alajuela or San José. For a private hospital, go to CIMA or Clinica Biblica. Need to go to CCSS for social security services, go here. If you brought your own medical prescriptions, find local pharmacies here or visit the vet for your pets. Looking for the post office? Then go here. You can stay in Sarchi for your banking. 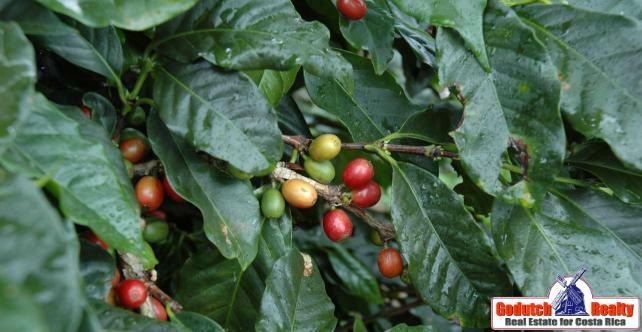 Coffee is the crop of choice. But many are starting tomato and sweet red pepper farms, offering more variety to the agriculture. The soil is very fertile because the town is located at the foot of the Poas Volcanoes. On this map, you can see clearly where the volcanoes and national parks are located, so you have an idea why the surroundings of Sarchi are always green. If you enjoy gardening or like to eat your homegrown fruits, Sarchi is a perfect place to do so. As your real estate agent in Sarchi, I am very knowledgeable about properties for sale, its prices, and its values. 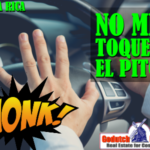 I know Sarchi better than any other real estate agent in Sarchi and I am fluent in English and Spanish, which is my forte while competing against real estate agents who only speak English. and a few large single family Sarchi homes built to North American standards. There are still no Sarchi condos. But I expect that to happen soon as more baby boomers will be retiring to Sarchi soon and they will want to travel the world. This will create more need for building secure gated communities. 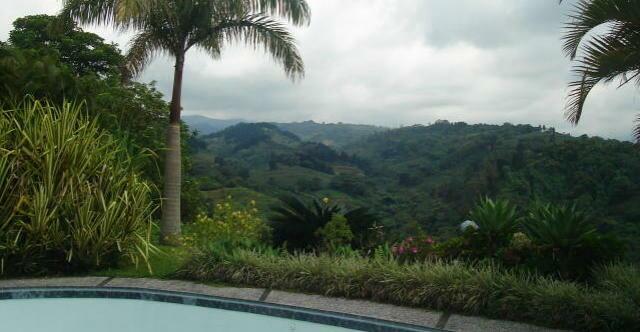 Please also have a look at our inventory in Sarchi before you buy a home, land or any property in Costa Rica. Some expats prefer to rent first so they can find out how it is to live in Sarchi. You can also check our Sarchi and surrounding area rental inventory. 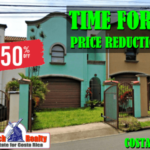 Contact me now and with pleasure, I will show you why it’s so great to live in Sarchi. 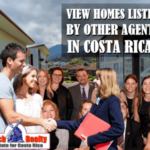 As the last recommendation, I´d like you to look at the list of recommended real estate attorneys before you buy any property in Costa Rica. Learn here who you will be dealing with and what Brooke can do for you.